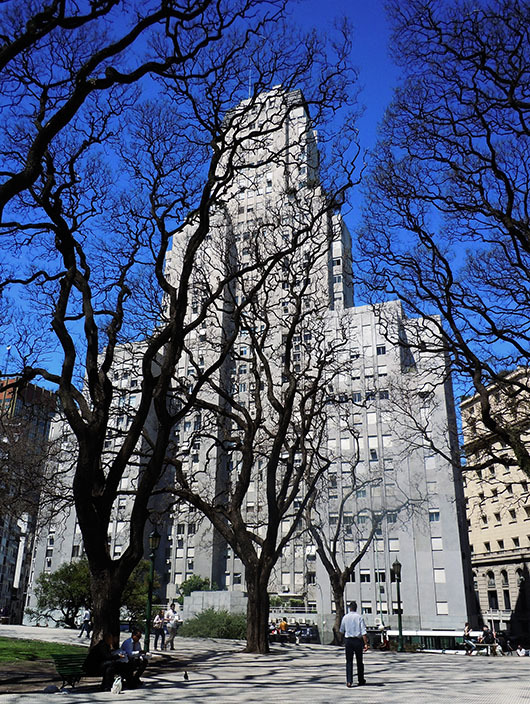 The Edificio Kavanagh in the Retiro neighbourhood of Buenos Aires is ostensibly a monument to the wrath of a scorned woman. And a reminder that you mess with a woman, especially one of means, at your own risk! 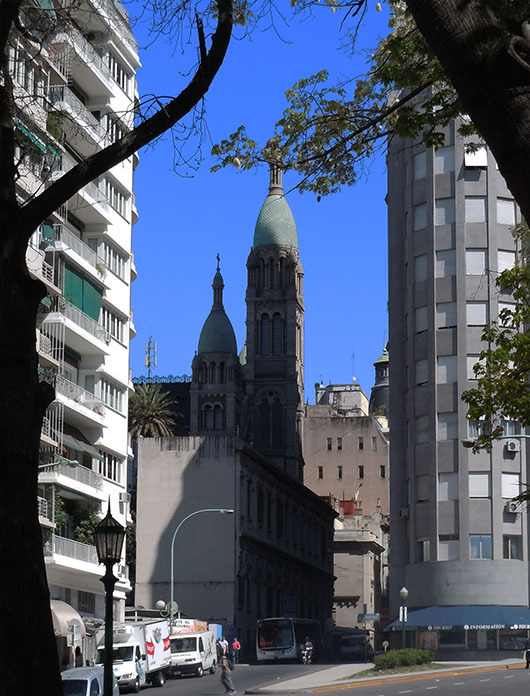 Corina Kavanagh, an Irish heiress, fell in love with Aaron, the heir to the Anchorena family, whose grand palace* and private church could be seen arrayed around the beautiful Plaza San Martin. The two hoped to marry, but Mercedes Castellanos de Anchorena deemed the nouveau rich, protestant bloodline of the Kavanagh family unworthy of her son and forbade the union. The son obviously had no say in the matter. An infuriated Corina vowed to avenge the humiliation. When the opportunity arose, she outbid Mercedes for the narrow, sloping plot of land in front of the church of the Holy Sacrament, that the Anchorenas had been planning to build a new mansion on, to be even closer to their church and crypt. Corina then entrusted her architects – the renowned Sánchez, Lagos and de La Torre – with a single brief: to erect a building tall enough to completely obscure the church from the Anchorena palace! Going to the extent of selling two of her estancias to finance the extravagant project! 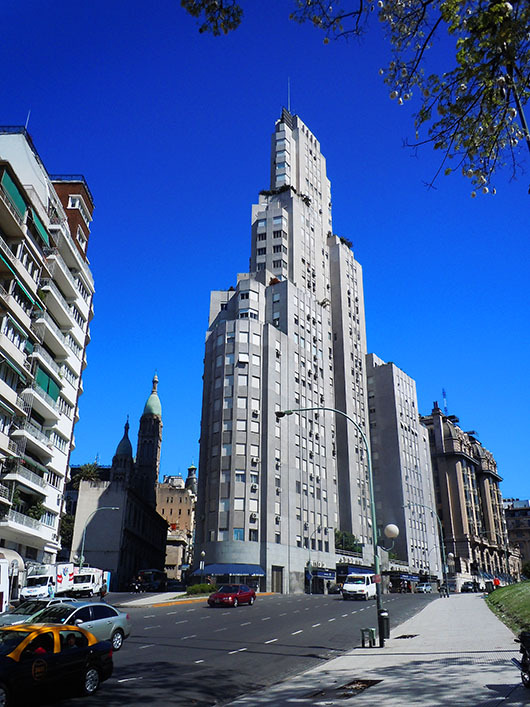 For an edifice conceived out of so much acrimony this 120 meter, 32 story luxury apartment complex is a remarkable piece of architecture, that has remained an iconic symbol of Buenos Aires! Built in 1934 (when Corina was barely 39) in the Rationalist style characterized by an economy of form and a lack of ornamentation, this was one of the world’s first reinforced concrete skyscrapers. One of the first with central air-conditioning and state of the art plumbing and for many years the tallest building in South America! Its 105 exclusive apartments are apparently still coveted and it was deemed a National Heritage in 1999. Corina retained the largest apartment that stretched across the entire 14th floor, where she lived until 1984, possibly reveling in the fact that Mercedes Anchorena would forever lie in the crypt of the Church of the Holy Sacrament in the perpetual shadow of the looming skyscraper that bore the Kavanagh name. * Some accounts suggest it was Corina’s daughter who had an affair with Aaron Anchorena. And I am such a sucker for these legends Boomie 🙂 Thanks for dropping by! Something doesn’t quite add up there, Madhu. Great story though. 🙂 That apartment block is certainly very imposing. Lovely isn’t it? Shows what a creative architect can achieve in the most difficult of sites! That strip of land is really narrow! A wonderful photo of this building. The story may or may not be accurate but it sure adds charm to the history of the building. I’m for it being true. Don’t mess with a woman’s heart. Thanks for sharing this delightful post. It’s quite a story whether it’s true or not. Thanks for sharing. What a fascinating story and you tell them so well Madhu! Ah, lovely to hear you say that 🙂 Thank you LuAnn! Lovely post Madhu, Very informative indeed..
Great story. I wouldn’t worry about the fact checking aspect – it doesn’t change my interest in the building. I’d love to see those apartments! Thanks for sharing. While I was busy looking at the ombu tree in the Plaza you were learning all this! 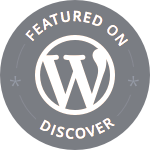 Ah, well – great post. 🙂 I would have been most strange if we had been there at the same time, back to back, shooting shots. What a tale… Would be fun to see the luxury apartment complex. What a fascinating story Madhu. the building doesn’t look that old, it must have looked ultra modern when it was built. Great story of two women who would not have been able to share the same space or air they breathe in if there was such a marriage. Can you see that weak husband between the two? What vision and what a building. Oh, Lisa that is very nice of you 🙂 Catching up with all my past posts as you can see! You had me hook, line and sinker! Whether true it not, it is a most entertaining story, and believable, channeling anger can be so powerful! Wow Madhu, what I yarn and I presume it is a true one. The world knows of the immortal love that made Emperor Shah Jahan build the timeless Taj Mahal. With your post, the world now can reckon with the timeless hate that made Corina build this monstrosity. At once fell in love with your post. I actually like the building Shakti! I am as much a fan of Art Deco structures as I am of the Taj MAhal 🙂 Glad you enjoyed this, happy to see you around. Really, really interesting. It’s amazing what stories are behind some structures. I love the quote as the opener for this post. Very fitting. That adage, hell hath no fury like a woman scored, is true. Whether the story is fact of fiction, it’s a compelling story. I hope for Corina’s sake that she didn’t spent too much time mourning the loss caused by a boyfriend who would not stand up for her against all odds. Or in plotting revenge. The latter hurts the person doing the action far more than any one else. Hi Madhu, I always say that the story’s the thing, and this is a good one! Thanks for sharing it, and the photo is a perfect illustration! Love the trees in that first pic!